In late 2013 at the Consumer Electronics Show in Las Vegas, Nevada, the small French startup called Kolibree debuted its version of a smart toothbrush. Their connected whirling wonder touts itself as being able to monitor your brushing habits with its electric toothbrush and linked smartphone app. The Kolibree app, which is designed work on both Android and iPhone systems, contains small sensors which can document and track your brushing habits and then give you feedback on where you could use more attention. Similarly, this February at the Mobile World Congress in Barcelona Spain, Oral B unveiled its take on the connected brush. Their SmartSeries brush, which will be available in Germany this spring before a worldwide release in June, is also connected to their own iPhone or Android apps. The Oral B offering features the ability for your dentist to record and chart how you brush and also for them to even program the brush for better performance based on your needs. The SmartSeries app also gives out real-time advice while you brush and stores up to 20 brushing sessions on before it syncs wirelessly using Bluetooth with your smartphone. As wearable technology continues to be more and more popular with items like Google Glass and Nike’s FuelBand becoming a regular part of our lives, these two offerings bring brushing your teeth into a new era. Just as the FuelBand or FitBit monitors how many steps you take, a connected brush can track how many strokes and time you spend brushing your teeth. With a dentist’s help, this data could be used to refine your habits and make your current dental activities more efficient. Though not cheap (the Kolibree will be sold at $100- $200 and the Oral B SmartSeries is set to sell above $200 in the U.S.), the connected toothbrush may allow kids and families a better way to get this usually mundane task done. There may be chances to “gameify” brushing with these apps to increase participation among those people who usually dread the act of brushing their teeth. Whatever method you decide, and whichever product you may be interested in, there are a few simple techniques that can really help when brushing your teeth. 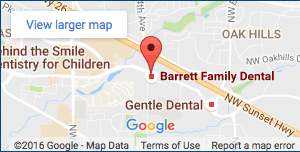 At Barrett Family Dental, we would be happy to help show you the best ways to keep your pearly whites clean and sparkling for years to come. Call or email us today!